Yet another late post, surprise! 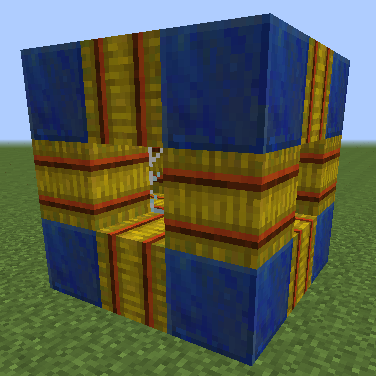 >.> Today’s post is about the structure of the multiblock, and how it works. The next posts will cover the types, species and modifiers of spirits. Will be keeping them latest every other day. The offering multiblock is the most important part of the whole idea of Arcane Assistance, and is both simple to do but allows complex results. The multiblock is a cubic frame, consisting of 3 types of blocks and requiring a single item. There is a Spirit Stone in the middle (glass is a placeholder), with 8 corner blocks and 12 connecting blocks. Each piece will change what spirit you receive from the offering, allowing you to customize your spirits. The Spirit Stone is the most important part of the structure. It is where the spirit will reside after the offering, and is what you place in your base in order to allow the spirit to interact with the things around it. A single Spirit Stone can contain multiple spirits of similar species, how many varying from each species. The corner blocks are what determine the type of spirit. There are 5 major spirit types, Item Spirits, Fluid Spirits, Energy Spirits, Arcane Spirits and Elder Spirits. These are marked by blocks of Redstone, Lapis, Glowstone, Emerald and Diamond, respectively. There are also Arcane Elder Spirits, which are the only exception to the types. In depth info on the types will be available in a later post. The connecting blocks in the structure determine the spirits species. There will be many species, but examples include Oak Spirits (see the introduction post) and Harvest Spirits. (above) The species of a spirit determine its range, carrying capacity and speed, as well as any other special skills such as farming or crafting. The different species of spirits are the main way of customizing your spirits. Once you have the multiblock built, the offering is performed by using the item form of the corner blocks on the Spirit Stone. For instance, the previous item Oak Spirit would require redstone dust, and the above fluid Harvest Spirit would require a piece of lapis. As an alternative, biome based modifiers can be obtained by offering an item matching the current biome, such as leaves in a forest or water in an ocean. More details on this in a later post. This entry was posted in Arcane Assistance, Mod Update by Nymphaea. Bookmark the permalink.